Providing you the best range of oxy99 sport for muscle training natural flavour, oxy99 sports gym & fitness workouts citrus orange flavour, oxy99 sport for sports & fitness grapefruit flavour, sport oxygen can, sport oxygen cans and oxy99 sports mountain climbing mint flavour with effective & timely delivery. OXY99sport has introduced an amazing sports oxygen can product in the market which is being increasingly becoming very popular with the customers. OXY99 sport oxygen provides high quality pure natural oxygen for increasing stamina and physical performance. We need oxygen to burn food to release energy and heat required for performing our day to day tasks. More oxygen we inhale, more energy or body is able to generate. Gym and muscle training needs a great deal of energy which can be easily got by inhaling from OXYsport oxygen cans. As we exercise or work out, our energy is quickly drained and we require supplemental oxygen to recover and relax. And, it is also used for achieving peak performance. 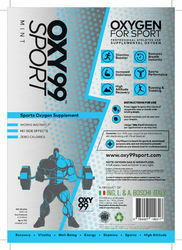 OXY99sport is now trusted as a remarkable product offering sport oxygen can. It provides gym goers with instant energy for attaining your fitness goal. Gym & fitness requires expending of extra energy for which you will require more oxygen for peaking up the effort as well as for recovery after you finish your workouts. Fitness freaks have reported consistently positive results after inhaling oxygen supplement. It also promotes immunity, mental and physical stamina and aids in cellular replacement. OXY99sport has introduced an amazing sports oxygen cans product in the market which is being increasingly becoming very popular with the customers. 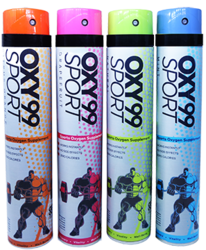 OXY99 sport oxygen cans provides high quality pure natural oxygen for increasing stamina and physical performance. We need oxygen to burn food to release energy and heat required for performing our day to day tasks. More oxygen we inhale, more energy or body is able to generate. Gym and muscle training needs a great deal of energy which can be easily got by inhaling from OXYsport oxygen cans. As we exercise or work out, our energy is quickly drained and we require supplemental oxygen to recover and relax. And, it is also used for achieving peak performance. OXY99sport is now trusted as a remarkable product offering sport oxygen cans. It provides gym goers with instant energy for attaining your fitness goal. Gym & fitness requires expending of extra energy for which you will require more oxygen for peaking up the effort as well as for recovery after you finish your workouts. Fitness freaks have reported consistently positive results after inhaling oxygen supplement. It also promotes immunity, mental and physical stamina and aids in cellular replacement. OXY99sport has introduced an amazing sports oxygen can product in the market which is being increasingly becoming very popular with the customers. 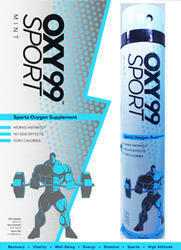 OXY99 sports oxygen can provides high quality pure natural oxygen for increasing stamina and physical performance. We need oxygen to burn food to release energy and heat required for performing our day to day tasks. More oxygen we inhale, more energy or body is able to generate. Gym and muscle training needs a great deal of energy which can be easily got by inhaling from OXYsport oxygen cans. As we exercise or work out, our energy is quickly drained and we require supplemental oxygen to recover and relax. And, it is also used for achieving peak performance. 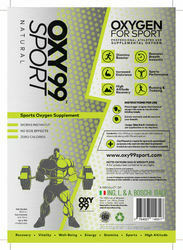 OXY99sport is now trusted as a remarkable product offering sports oxygen can. It provides gym goers with instant energy for attaining your fitness goal. Gym & fitness requires expending of extra energy for which you will require more oxygen for peaking up the effort as well as for recovery after you finish your workouts. Fitness freaks have reported consistently positive results after inhaling oxygen supplement. It also promotes immunity, mental and physical stamina and aids in cellular replacement. OXY99sport has introduced an amazing sports oxygen product in the market which is being increasingly becoming very popular with the customers. 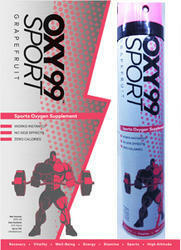 OXY99 sport oxygen provides high quality pure natural oxygen for increasing stamina and physical performance. We need oxygen to burn food to release energy and heat required for performing our day to day tasks. More oxygen we inhale, more energy or body is able to generate. Gym and muscle training needs a great deal of energy which can be easily got by inhaling from OXY99 sport oxygen cans. As we exercise or work out, our energy is quickly drained and we require supplemental oxygen to recover and relax. And, it is also used for achieving peak performance.